October is an exciting month. With Halloween creeping around the corner adults at Spencer Public Library have a variety of exciting free programs. Everyone loves a treat during Halloween, but how about turning that treat into art? Join the DIY club as we take some common food and turn it into Halloween food art. We will make white chocolate covered strawberry ghosts, Frankenstein Monster Ho Ho’s, and Butterfinger dip. Enjoy the making as well as the eating! October 3 @ 6:30 PM - Registration required. Join the Authors, Phil and Sandy Hamman, on Monday, October 10th at 6:30 PM, as they present the inside story of the book Gitchie Girl and the events surrounding the Gitchie Manitou mass murders that happened in Gitchie Manitou State Park in Larchwood, Iowa. The presentation portrays the survivor’s story of Cheskey’s many struggles to rebuild her life emotionally and spiritually following a sexual assault that night. Gitchie Girl is a #1 national best seller on several of Barnes & Noble’s and Amazon’s true crime lists. Books will be available on site for purchase. Our free movie for October is Ghostbusters, a comedy Fantasy/Science fiction film starring Melissa McCarthy, Kristen Wiig, Kate McKinnon, Leslie Jones, and Chris Hemsworth. Ghostbusters is a 2016 remake of the 1984 movie with the same name. Following a ghost invasion of Manhattan, two paranormal enthusiasts, a nuclear engineer, and a subway worker band together to stop the otherworldly threat. As always, snacks will be provided – Registration required. The library is partnering with the Spencer Community Schools and doing a special intergeneration book discussion. We will be reading The Things They Carried by Tim O’Brien in October and then discussing the book with High School Juniors and Seniors in November. The novel takes a hard look at a platoon of American soldiers in the Vietnam War. Weapons and good-luck charms carried by U.S. soldiers in Vietnam represent survival, lost innocence, and the war's interminable legacy. The book, based on the authors experience in the war, has become a classic and nominated for the Pulitzer Prize in 1990. Sign up to check-out a copy of the book. The discussion will take place at Spencer High School. Lunch will be provided. The Books To Movies club will watch About Schmidt starring Jack Nicholson on October 24 @ 6:30 PM. About Schmidt is a drama about a lonely, recently widowed and retired man trying to reconnect with his adult daughter. 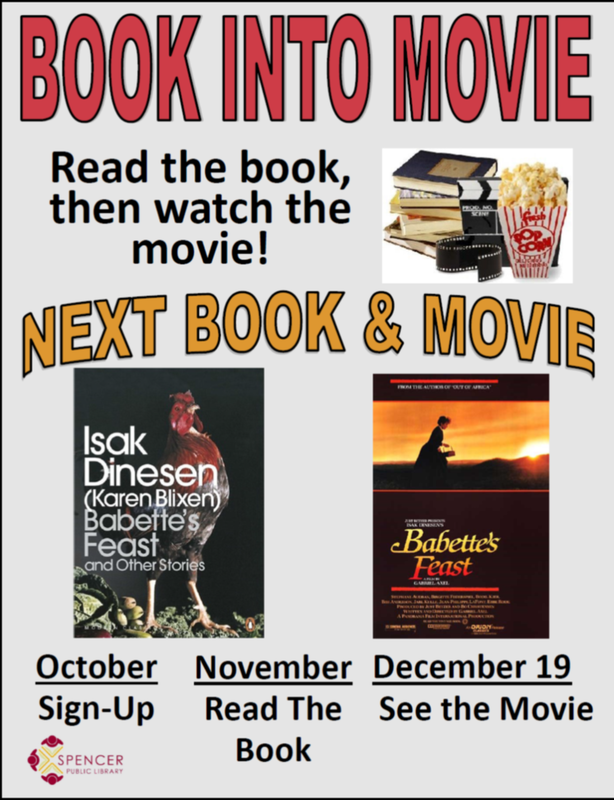 Everyone is invited to watch the movie even if you never read the book or you have previously read it. 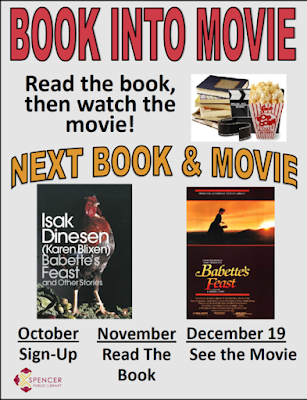 The next Book to Movie is Babette’s Feast a short story written by Isak Dinesen (Karen Blixen). The movie, in French and subtitled in English, won the Academy Award in 1988 for best foreign film.